“cuach – a wooden cup; a drinking cup; quoich, bowl of a nest”, Gaelic Dictionary, Acair Ltd. and Aberdeen University Press, 1979. The word we know today as Quaich is a derivation of the Gaelic word “cuach”, defined above. It would appear that perhaps the word evolved too from “quoich”. Quoich is also a word used to describe a cup shape, for example the place named Loch Quoich, a loch and reservoir located in the west Scottish Highlands. Historically, the Quaich was used as both an eating and drinking vessel and of wood stave construction. 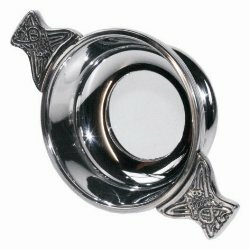 A Quaich characteristically has two handles, called “lugs” and is distinctly of Scottish origin. One of the earliest known references to the Quaich dates back to 1589 when King James VI of Scotland is said to have given one to Anne of Denmark as a wedding gift. It is thought that this gifting has contributed to the Quaich also being called a “Loving Cup”. Bonnie Prince Charlie was also said to have a Quaich as part of an ornately decorated sterling silver canteen set, which he carried with him during his travels, including at the Battle of Culloden in 1745. His Quaich was said to have a glass bottom so that he could keep an eye on his enemies, such as the Quaich to the right. Over the years, the Quaich has also evolved as a toasting cup, lending to yet another name, the “Cup of Friendship”. It has been used as a common toasting cup to celebrate visitors, weddings, christenings, family and friends or just to share a dram of fine Scottish whiskey. And its construction evolved over the years too. Quaichs were also made of pewter, sterling silver and even gold. Aristocracy took an interest in fine Quaichs, the making of which became a well respected profession. The National Museums of Scotland has fine examples of all of these in their Quaich collection. Click on these links to see: a 1692 Wooden Quaich with Silver Mounts and Quaich with Three Lugs and a Coin of Charles II, and a Quaich constructed of alternating staves of Ebony and Ivory, constructed in the 1700s, as well a silver Quaich ornately decorated with Thistles and Cairngorm Stones, produced in 1878-9. These beautiful examples illustrate the evolution of the Quaich from a utilitarian design, to one of lavish importance. Sir Walter Scott (1771-1832), famed Scottish author, was fond of serving libations from his collection of Quaichs. One of his Quaichs, the “Waterloo Tree Quaich” was recently recovered after being stolen from Abbotsford House near Melrose in 1994. The Quaich is made of silver and elm wood that was cut from a tree at the Battle of Waterloo site. The Duke of Wellington supposedly directed troops against Napoleon from beneath the tree, which subsequently became a source of souvenir wood. The Quaich was made in 1824. It has also been reported, that a recent auction fetched over £20,000 for a Silver Quaich, thought to be the most ever paid for a piece of silverware. Today, the Quaich enjoys a place in Scottish, American and Canadian cultures as a fine traditional drinking vessel linked to the past. And how do you say Quaich? In Scotland, the guttural "ch" sound ends the word, such as in the word “loch”. The Americanized version of the word tends to be more like “quake”.